Jimmy as named the Associated Press Class B All-State Special Mention as a linebacker for the 2012 season. He was also named to the Lansing State Journal Dream Team and All CAAC Red Division first team. Small of stature from a typical linebacker, Melton’s ability to hide behind his huge defensive line made him hard to find to block. His quickness made him one of the best sideline-to-sideline linebackers DeWitt has had since Cody Worden in 2007. His toughness showed as he played for a good part of the season with a broken right hand. 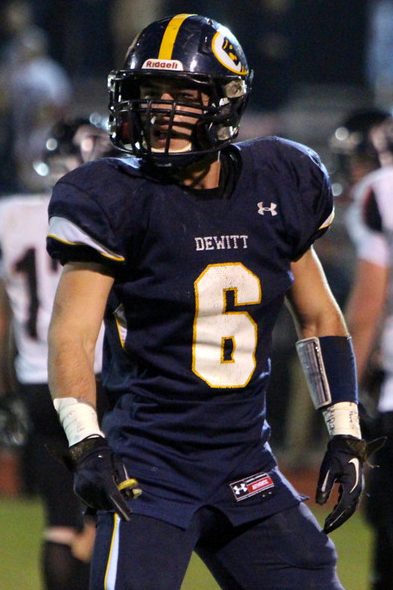 Jimmy is in the top few of all time tackles for a season for DeWitt with 173 total tackles with 68 solo and 104 assists. Among the highlights are an impressive 24 tackle game against Haslett, 20 against D-5 champs Portland,18 against Owosso, 18 against St. Johns and 17 against then undefeated Fruitport. A big game player, Jimmy had 55 tackles in the four Panther playoff games and led the young Panthers to a birth in the Division 3 semi-finals. As of this writing, Melton is third all-time for number of career tackles with 258.